This is F1. It's why we watch it. It's why also as well as it being the most compelling companion it can also - even in the same moment - be the cruellest ogre. This applies to most sports of course, but motorsport is different. In this game things literally aren't over until they're over. In football for example everything along the way counts and is permanent - the goals you score can't be scratched. Even the mightiest implosion likely won't threaten your win if you are four-nil up with 10 minutes remaining. In this Malaysian Grand Prix, Lewis Hamilton was the F1 equivalent of four-nil up with ten minutes remaining. But it was indeed an implosion, one of his Mercedes power unit, that left him in a blink with nothing. It lost him the race and all points; it could well lose him the world championship too. That's another F1 perennial, that even the very biggest prizes can hinge on such things. They often do in fact. And there couldn't have been more misdirection in the build-up. 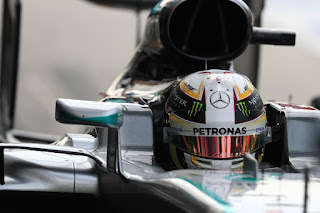 All weekend Lewis has been serene, topping times, taking pole easily, and all the while leaving his title foe and team mate Nico Rosberg looking rather short of breath. Lewis's usual stumbling block of the race start was surmounted, and in some style as not only did he lead but even better for him a slightly lairy Sebastian Vettel tapped the back of Nico and spun him around, leaving him down in P21 (it also meant that Seb, his front left corner now askew, was done for the day - and later got a three place grid penalty for the next race). That was until lap 41 of 56, which is when Lewis's Merc unit unstitched itself. His audible despair on the radio told us everything. Suddenly Nico was in the box seat, as he'd recovered well to third after some adventures. In a championship fight full of twists and turns, one afternoon squeezed in a number more. There was an irony kicking around too that it was Lewis that was able to fit a new engine this time, following his Spa stockpiling. It was Nico's units that were longer in the tooth. That, too, is F1. Nico's resultant 23 point title lead with five to go looks healthy, and hard to surmount. Someone worked out that one more win, and following Lewis home everywhere else, will be enough. But the way this one is going it's likely unwise to extrapolate too far ahead. It probably won't be any sort of comfort to Lewis, but if the same thing happens to Nico in Suzuka in seven days, and he takes full advantage to win, then Lewis equally suddenly leads the table himself. That, too, is F1. Lewis amid his disappointment stirred the pot too, suggesting in front of microphones that there was something more to this: "Something or someone doesn't want me to win this year" he said. "There are eight drivers [with Mercedes engines] and mine's are the only ones who has failed." Not smart of course, but also very Lewis. We know that he's very heart on sleeve, particularly in disappointment, and as outlined this disappointment was crushing. One presumes all in the Merc camp will get over it. 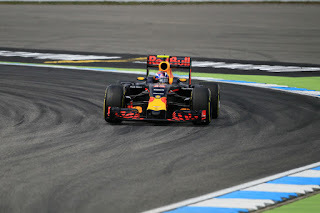 The race had already been jumbled by a Virtual Safety Car appearance after eight laps, which of the leaders Max Verstappen alone took advantage of by pitting there and then. For a time it looked the right move and that he might even threaten Hamilton for the win, as he was in a net and then actual race lead for a time. His second stop however came early due to excessive degradation, meaning he had tyres only seven laps fresher than Lewis's and was some 16 seconds shy, and Lewis might not even be pitting again. Hamilton again looked set fair, and stretched his advantage further to the point of having sufficient 'delta' to make another precautionary stop should he want. That was until lap 41. Lewis's departure left us all of a sudden with a Red Bull one-two, and one that couldn't be closer. 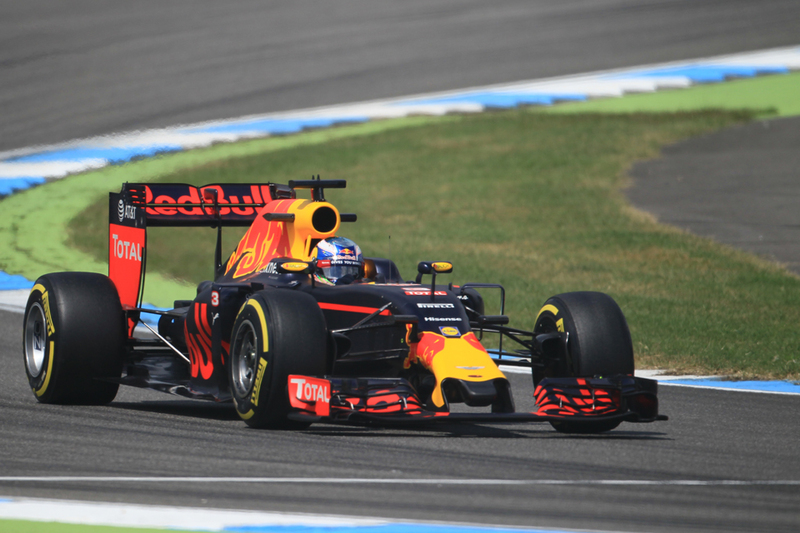 For the preceding laps Daniel Ricciardo had been almost conjoined with the chasing Verstappen, who with their split strategies was on fresher tyres. 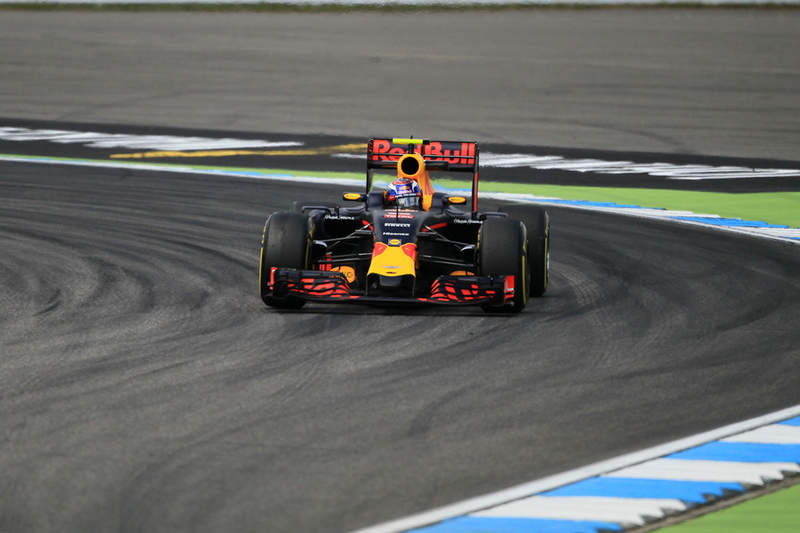 Unlike in Hockenheim earlier this year there was no team phone call to resolve the situation, even though Max (who lost out that time in Germany) seemed to be asking for one. The battle was feisty - the pair even went through the rapid turns 5 and 6 complex side by side - and as it transpired crucial. Ricciardo against all odds kept Max behind. And then when the Virtual Safety Car was deployed to clear up Lewis's stricken machine both Bulls were pitted, and that - equalising things - was that. There was some muttering that perhaps Red Bull was in this making a make-up call, what with Ricciardo losing out on probable wins in Spain and Monaco earlier this season thanks to team errors. Boss Christian Horner insisted not though. "The guys raced each other hard and fairly today, and we gave them that chance and they repaid us fantastically well" he said in the win's afterglow. "It made total sense [to pit them both under the Virtual Safety Car]" he went on, "there was a free stop for both of them. Take the risk away, put them both on new sets of tyres and then a flat-out race to the finish". He insisted too that there were no team orders. Verstappen also was content. "It was a good result" he said. "I think we were a bit unlucky with the safety cars, especially the last one, the Virtual Safety Car. But you know that's racing as well, it can't be all the time perfect...". That, also, is F1. He felt that being compromised by the first turn contretemps had cost him more (it left him fifth but he vaulted back to third quickly when green flag running resumed). "I got very compromised...basically I think that cost a bit of my race...I think we had definitely the speed to win today." 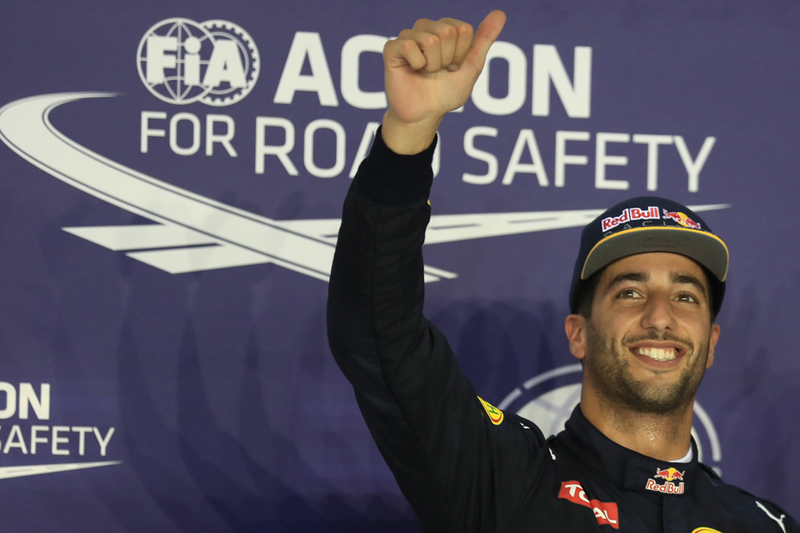 In any case it's hard to argue that Ricciardo doesn't deserve a win from the 2016 season. And he immediately rather summed things up. "Told you I'd win one," he said breaking the fourth wall in the podium anteroom. "Sometimes you need a little bit to go your way. Swings both ways." The victor also provided welcome antidote to a day with its fair share of acrimony, displaying sheer spontaneous joy and emotion. "I'm overwhelmed with emotion, happiness right now" he said. "Super-happy to be back here, it's been over two years since my last win" a statistic that seems perverse. "Perseverance and a good positive mindset has kept us in this fight. "Another thing which in all honesty was a life-changing moment was the loss of Jules [Bianchi], so I definitely want to dedicate this to him." 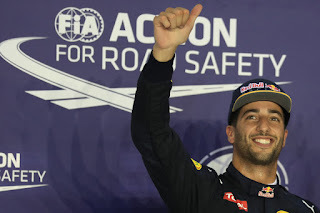 It was all a timely reminder too, not that we really need it, of Ricciardo's sheer star quality in and out of the car, that F1 really should be making all it can of. For Nico the only remaining matter was him getting ten seconds over the pursuing Kimi Raikkonen to ensure his third place, after the stewards had decided to penalise him thus for his robust move to get that place from Kimi in the first place. It was a sanction that struck most as absurd. Nico too reflected on the dumb luck which was sprayed around plentifully today. "I'm happy to be able to fight back all the way to the podium. In general I wish for a better day but that is how it is sometimes." He also had some sympathy for his team mate. "For Lewis, I have been in his position and know how terrible it is in that moment so I know what he is going through." There were fine drives further down too - Valtteri Bottas recovered from his disappointing qualifying to finish fifth via a highly unlikely one-stop strategy. The tyres indeed on this new model Sepang track held on much longer than in previous visits, and one-stoppers looked a goer from around mid-distance. but the late Virtual Safety Car intervention meant most didn't do it. 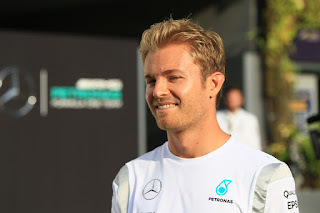 The only other driver indeed to stick to the approach was Jolyon Palmer, who got his first F1 point, the solitary one for tenth place. Fernando Alonso was another star to rise today, from starting dead last he got up to seventh by the end. In that way of his he vaulted to tenth place after just four laps, and fought from there. He got lucky with that late Virtual Safety Car mentioned, as it played into the hands of his three-stopper which didn't appear to be going anywhere without it. Still he was fast and aggressive throughout and you can make the case that he made his luck.